I designed and wrote the copy for this CTA to be placed at the end of relevant blog posts (such as this one) for Spoiler Alert. The goal of the CTA was to drive conversions to "Request a Demo" with our sales team. The CTA incorporates imagery, action-based copy, and a pop of green color for the button. I designed and wrote the copy for this bottom-of-the-post CTA to include on blog posts, along with the corresponding landing page (see screenshot below). The "Download Now" button the CTA takes a website visitor to the landing page to download the tax infographic through a form submission, which was followed by a thank you page, thank you email, and lead nurturing email sequence. These are two bottom-of-the-post CTAs I designed to promote our long-form piece of content, A Beginner's Guide to Food Waste. The "Download My Guide" and "Download Now" buttons lead to the landing page on the right, which asks for a contact's email address in exchange for the PDF download. This particular piece of content was our most popular download and gained major industry recognition, many backlinks, and significant website traffic. I researched, designed, and implemented four lead flows (read more about lead flows here) for the Spoiler Alert website using HubSpot in an effort to drive conversion on certain offers and increase MQLs. Three of the lead flows were developed as slide-ins and one lead flow was triggered upon exit intent. Find a few examples of my work below. Set up to appear at a 50% page scroll on the How It Works page, this slide-in CTA allows a website visitor to book time with a member of our sales team with the goal of driving qualified MQLs who are at the middle-of-the-funnel or bottom-of-the-funnel. For the copy, my goal was to use a strong question as the header with a casual tone. The same low-risk phrasing is used for the button as well with the words, "Let's talk." For the form, we wanted to capture just enough information to make the lead useful to our sales team without using too many fields and discouraging a lead from submitting their information in the first place. We felt that four fields wasn't too intrusive and gave our team enough information for follow up. Set up to appear at a 50% page scroll on About page and Customer page, this slide-in CTA encourages a website visitor to sign up for our monthly e-newsletter. The goal of this slide-in is to drive newsletter sign-ups for top-of-the-funnel leads and general fans. For the header copy ("Can we stay in touch?") and the button ("Yes, I want to stay in the loop! "), I wanted a casual tone and no generic language (such as "Sign up for our newsletter"). To capture middle-of-the-funnel interest on our Enterprise page, I implemented a pop-up CTA through HubSpot's lead flows tool to be triggered upon exit intent. 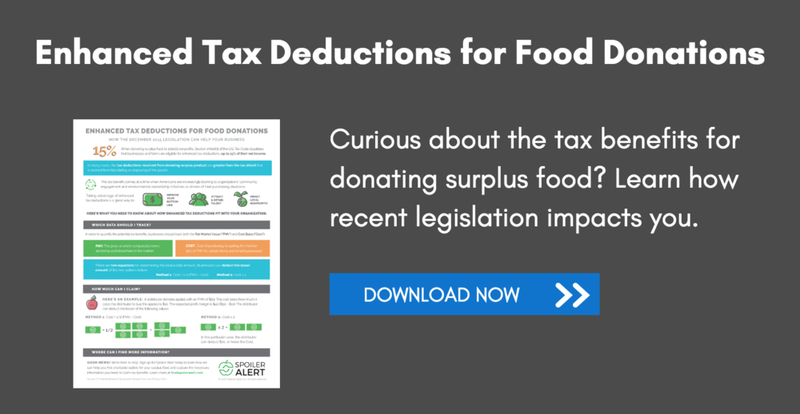 The pop-up offers an infographic download about tax deductions for food donations in exchange for a website visitor's email address.